Lionel introduces the 2011 BSA Ready-to-Run Train Set. 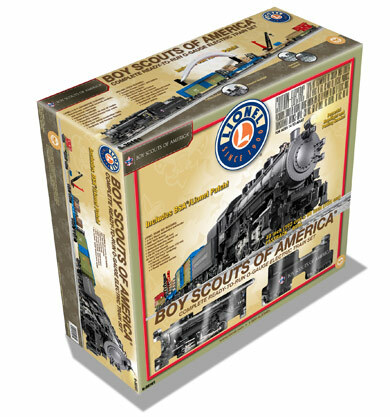 The set will be similar to the 2010 100th Anniversary set except the 100th Anniversary boxcar will be replaced with the BSA Boy Scout Oath boxcar. In addition, the 100th anniversary collector patch will be replaced with a BSA/Lionel collector patch with the new BSA signature tagline, Prepared. For Life. Also, this summer, Lionel will be adding the BSA Eagle Scout Boxcar, BSA Flatcar with Pinewood Derby Kit, and for the first time, figure pack accessories. The entire train is approximately 58" long with layout dimensions of 40" x 60". For more information on the model and vendors, please visit Lionel's website. To celebrate the first 100 years of Scouting, The Bradford Group will introduce an illuminated, electric train featuring illustrations by Norman Rockwell. This classic HO-Scale collectible train set from Hawthorne Village, a division of The Bradford Group, includes precision detailing from the brass wheels of the train cars to the shining light from the locomotive's headlight. 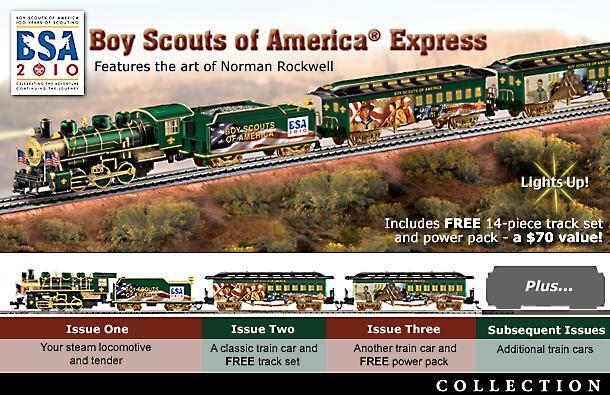 This Boy Scouts of America®100th Anniversary collector's train set depicts full color artwork of various Norman Rockwell illustrations on the passenger trains, plus parts of the Scout Oath. The train set can be purchased at The Bradford Exchange online. 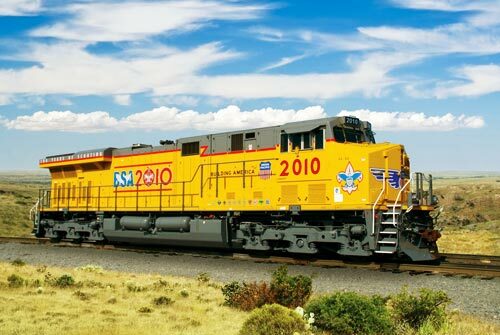 Bearing the road number 2010 and based on the ES44C model, Union Pacific has issued a commemorative locomotive engine to celebrate the Boy Scouts of America's 100th Anniversary, only the 14th time in its 150+ year old history. Lionel, an official licensee, has replicated the design and artwork of the actual Union Pacific engine which honors the 100th Anniversary of the Boy Scouts of America. The limited edition train as depicted below is featured in Lionel's 2010 Ready-To-Run Catalog and begins shipping this month. Just like the original Union Pacific No. 2010 BSA Locomotive, this engine will feature: the Boy Scouts of America® corporate trademark logo; the BSA® 100th Anniversary logo; and the words, "100 Years of Scouting". For more information on the model and vendors, please visit www.lionel.com. Celebrate Scouting with the Boy Scouts of America and the United States Postal Service! On July 27, 2010, in Fort A. P. Hill, Virginia, the Postal Service™ will issue a 44-cent, Scouting commemorative stamp, designed by Derry Noyes, Washington, DC. To create this original design, illustrator Craig Frazier, Mill Valley, California, depicted the images of two different scouts in clothing and accessories that are often part of the outdoor scouting experience — hats, packs, boots, and binoculars. At first glance, one sees the large silhouette of a scout peering through binoculars. Within this figure is another scout perched atop a mountain taking in the vista. "I wanted a level of discovery to be portrayed in the stamp itself," Frazier recalls. He continues, "The small figure and landscape indicate very hard, directional light coming from low on the horizon — either early morning or late afternoon. The sky has that pale blue to indigo transition that happens only at those two times of day." The stamps and other collectible items are available for pre-order at the online Postal Store, and they go perfectly with the BSA Centennial Letterheads. To learn more about the stamp and the associated Supporting Our Troops program, visit the BSA Centennial website.